Our annual Celebrating Education Gala on Saturday, April 27 is gonna be outta sight! Don’t be a square – come have a blast at the bash with cool cats and foxy chicks enjoying a night that features Route 66 – the Mother Road, with classic cars, delicious food, live music, dancing, tasty beverages including signature cocktails, and our highly anticipated silent and live auctions. Have a gas of a time for a good cause – supporting the school that you love. All proceeds at the Celebrating Education Gala benefit the Time to Lead Middle School building campaign. This righteous event will be held at the Clermont Performing Arts Center, 3700 South Highway 27 in Clermont, Florida 34711 on Saturday, April 27, 2019 from 6:00-11:00 p.m. The pre-event VIP cocktail is from 5:00-6:00 p.m. with doors for General Admission opening at 6:00 p.m.
Don’t shine us on – be made in the shade and get your tickets today! General Admission is $125.00 per person until March 29. After March 29, admission will be $150.00. Admission includes food, beverages, and entertainment. Get your tickets now! A variety of sponsorship levels are available now - check it out! This year's auctions include a choice variety of trips, golf excursions, getaways, and great prizes to go ape for! Don’t skedaddle early if you want to bid on the Live Auction items, but don’t flip your wig because you can bid on Silent Auction items from wherever you are – having a blast at the event or at home and comfy on the couch. All the proceeds of this fab event benefit Montverde Academy and most importantly, provide resources to our students for the best college preparatory experience possible! Bugging out over what to wear? Here’s some inspiration to grab some rad threads and fit right in. 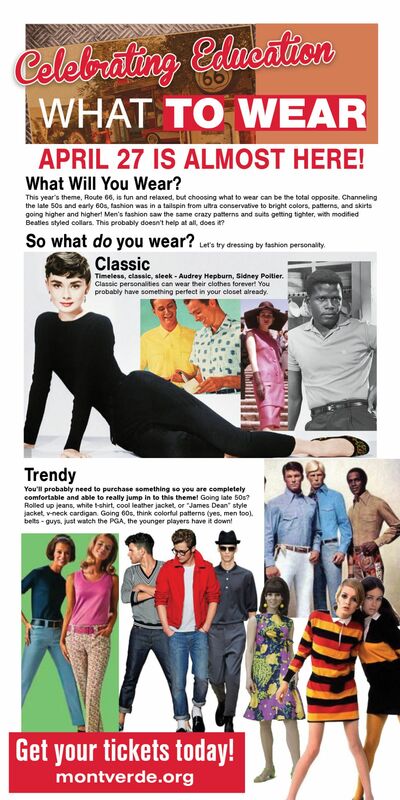 More help on dressing to the sixties theme. Please do dress tastefully.